I wanted to visit a senior center to see what they were about. My neighbor’s 75 year old mother Janet is an active participant in the ballroom dancing program at West Cobb Senior Center so I decided that would be a good center to visit. Janet is a traveler, takes cruises, collects antique dolls and is a dealer also, is a ballroom dancer and her home has many unique antiques which she has collected. She is an interesting person so this Senior Center must be OK. They have a ballroom dance practice from 1 to 4pm so I plan to be there a 1pm. I wanted to visit a senior center to see what they were about. My neighbor’s 75 year old mother Janet is an active participant in the ballroom dancing program at West Cobb Senior Center so I decided that would be a good center to visit. Janet is a traveler, takes cruises, collects antique dolls and is a dealer also, is a ballroom dancer and her home has many unique antiques which she has collected. She is an interesting person so this Senior Center must be OK. 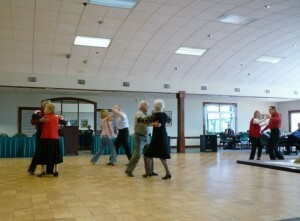 They have a ballroom dance practice from 1 to 4pm so I plan to be there at 1pm. Even thought there are many senior centers close by to me, I take the hour long trip from Johns Creek Georgia over through Roswell to Marietta down Whitlock Ave then out a long stretch of Dallas Hwy. Right when my MapQuest says, there it is as I turn left in to the entrance of Cobb County Parks and Recreation campus. 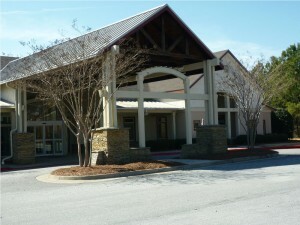 The sign says West Cobb Senior Center as I turn in to a nearly full park lot facing a attractive lodge type building. Nicely dress people are zooming in the lot and hurrying in to the building. Must be the dancers. I enter to an attractive large lobby with stack stone fireplace and people zooming by me to sign in. The place is abuzz with activity. A lady at the open administrative office spots me looking over the information table and introduces herself as Cristina, the Program Specialist. I let Cristina know I am here to check out the center and meet Janet at the 1pm dance program. I am early so Cristina gives me lots of information about the senior center activities. There are about 18 people sitting around a large conference table in a room across the lobby from where we are talking and Cristina tells me that is a meeting of the Great Ideas Book Club. Later I take a walk down the right wing of the building and see two more similar conference rooms with equal amounts of people sitting around the conference table. These I find out later are the Woodcarvers Club and the Shutterbugs Club. Another two rooms I spot gamers, playing Mah Jongg and Scrabble. Lots of mental stimulation going on today. Christina tells me the West Cobb Senior Center is an active adult multi-purpose center open to anyone 55 or better. You do not have to live in the country to use the center. They have people ages 55 to 92 using the center. It is well used, I must say. Besides the activity in the center it is located in the Parks and Recreation area with walking trails and ball fields nearby. In addition to dancing, the center has two yoga classes that are fully attended and exercise programs to keep participate active physically. At the end of the end of the right wing, Cristina tells me to visit the Billiards room which I do and see 5 tables in a nicely decorated room. 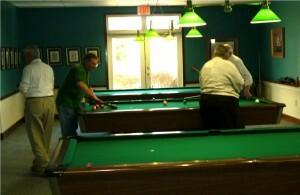 A group of 5 men are playing pool at one of the tables. Christina hands me “The Leaflet” which lists all the programs and activities of the center is offering for the month and I am astounded at the quality and the number. Wellness seminars, trips, health screenings and tons of classes. I see they have a trip to Atlanta’s historic Fox Theater planned. These were equal or better than those offered in the Del Webb Active Adult Communities I have visited. I am impressed. It’s now 1pm so I head down the left wing of the building to a grand ballroom where I hope to see Janet. There are nicely dressed dancers signing in and greeting each other with hugs. It is a nice large comfortable room. A man who must be the greeter comes over and introduces himself and welcomes me. He’s thinking I’m a dancer, but I tell him I was looking for Janet. He says Janet usually gets there at a later time. The sound equipment is now set up and the first few dancers are on the dance floor twirling to the music. I watch for a few minutes and head back to say goodbye to Cristina. On the drive back I am thinking it sure would be nice to have the West Cobb Senior Center close by to me. My impression is way better than I had in mind before making this visit to a senior center. I can see where Senior Centers could be and are an asset to anyone who uses them, encouraging us to be active both mentally and physically. I am sure not all Senior Centers are alike and offer as much as this one did. 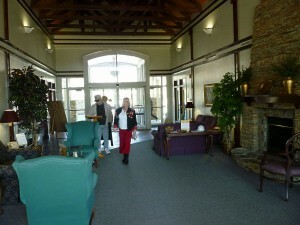 But still is shows me what is possible and changes my uninformed image of a Senior Center. I will check out the new Johns Creek Senior Center that is being built near me for sure and some other seniors center in Georgia. 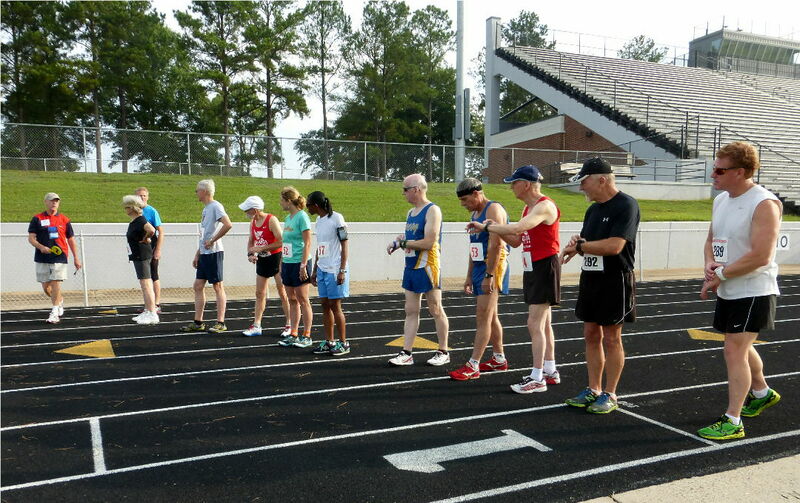 This past week I went down to Warner Robins GA to the Georgia Golden Olympics games to participate in the 1500 meter race walk in hopes of qualifying for the National Senior Games in Minneapolis MN in July 2015. 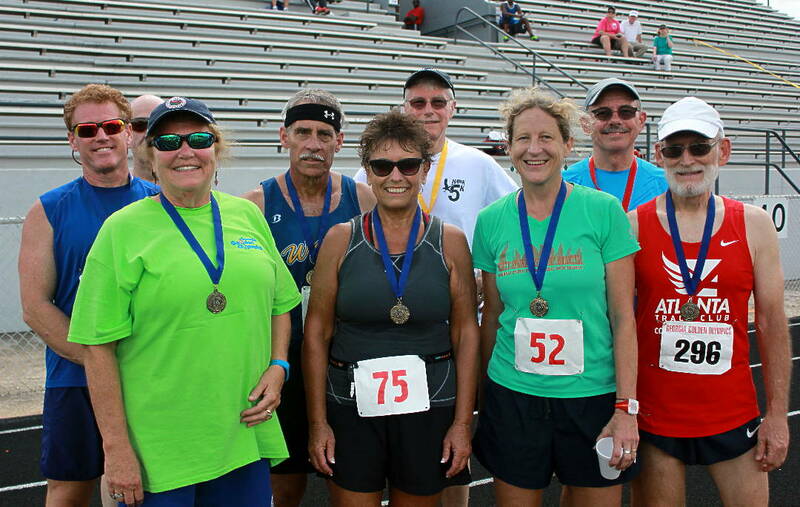 The Georgia Golden Olympics are held every year in September down in the middle Georgia city of Warner Robins, home of Robins Airbase. This year those who participate and come in at the top four positions qualify for the National Senior Games which are only held every other year. 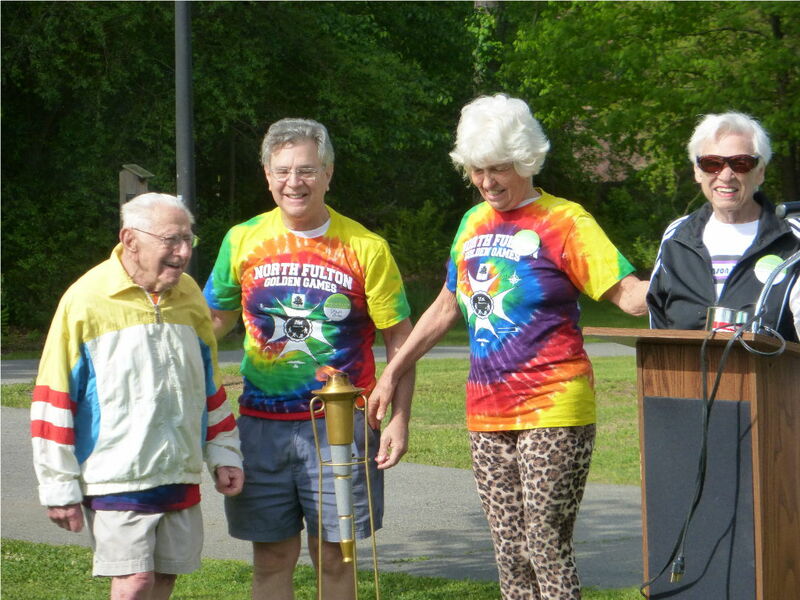 2014 is the qualifying year at the state level for the 2015 National Senior Games. We only spend Thursday PM and left Friday PM but did get to see several events. On Thursday our first stop was the Warner Robins Senior Activity Center where we registered and saw the list of people who would be competing in my event on Friday. We got a T-shirt and other items in a welcome package. 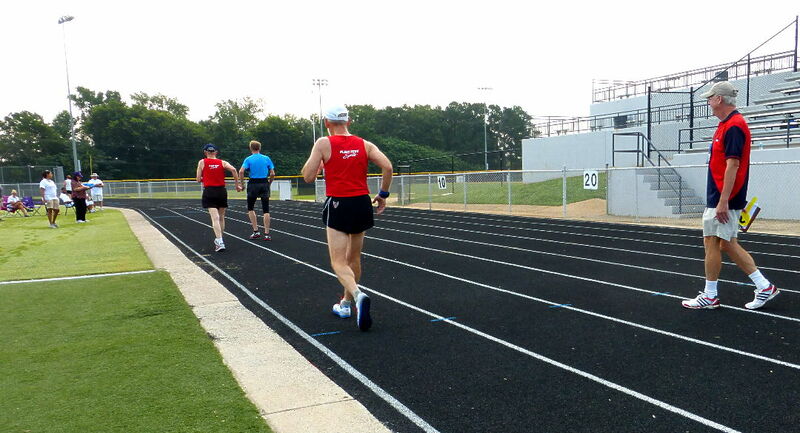 Next we headed over to Robins High School’s McConnell-Talbert Stadium on nearby S. Davis Drive where a lot of the Track and Field events were being held. 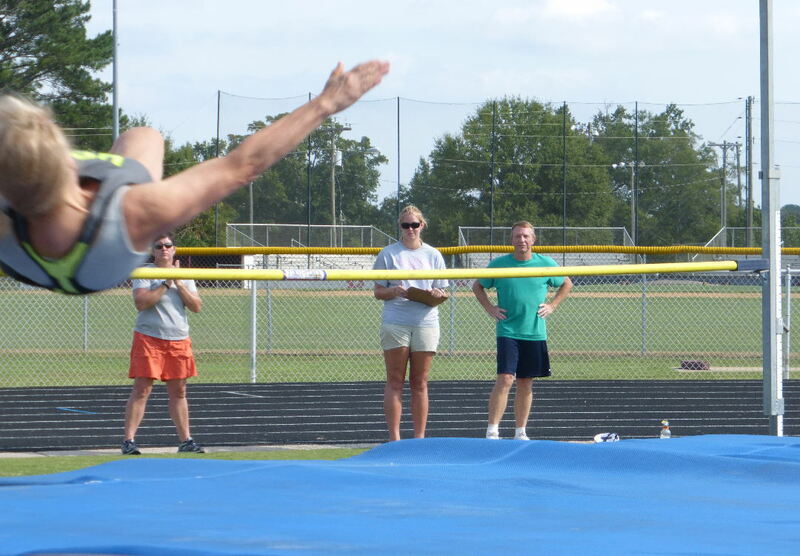 We spent some time watching the high jump where both male and female contests had a friendly but competitive match. It amazed me how high they were jumping. I saw more than a few ace bandages and ice packs. I got to check out the impressive track where I would be race walking the next day. On Friday morning I got up early and was one of the first ones to arrive at the stadium for Jim Norvill’s race walking seminar. I stayed to watch and photograph the 5K race walk. 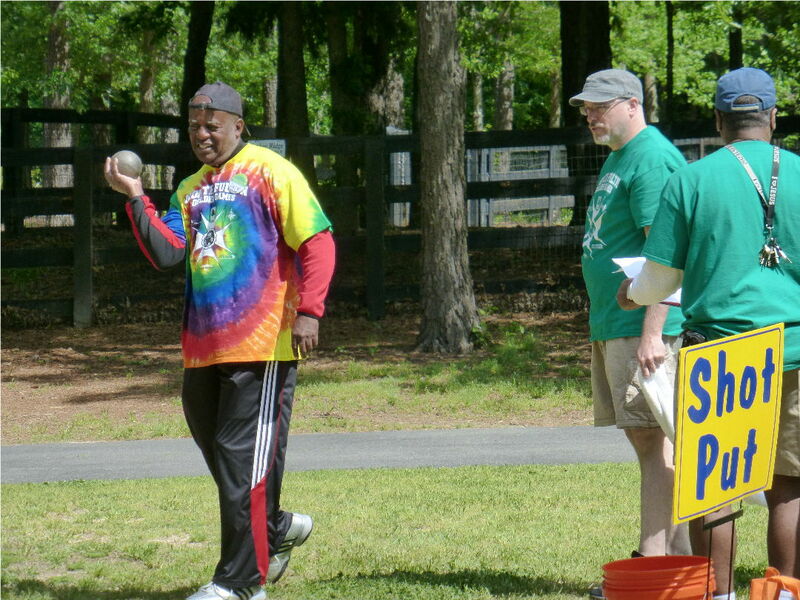 There were about 11 contestants ranging from seasoned veterans to a new comer or two. These race walkers really put a lot in to the contest which is about 3.1 miles or little over 12 times around the track. 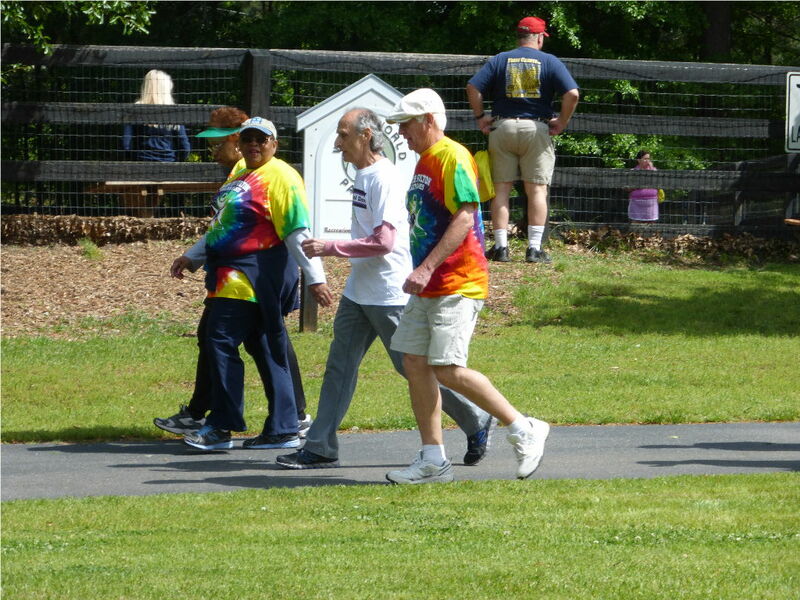 Several of the same race walkers would be coming back at 1pm for the 1500 meter race walk that I had signed up for. I stopped by the Senior Activity Center again to check things out and met Ms. Vicki Pilgrim who was directing these games and doing an excellent job keeping track of so many things going on with the events and people. 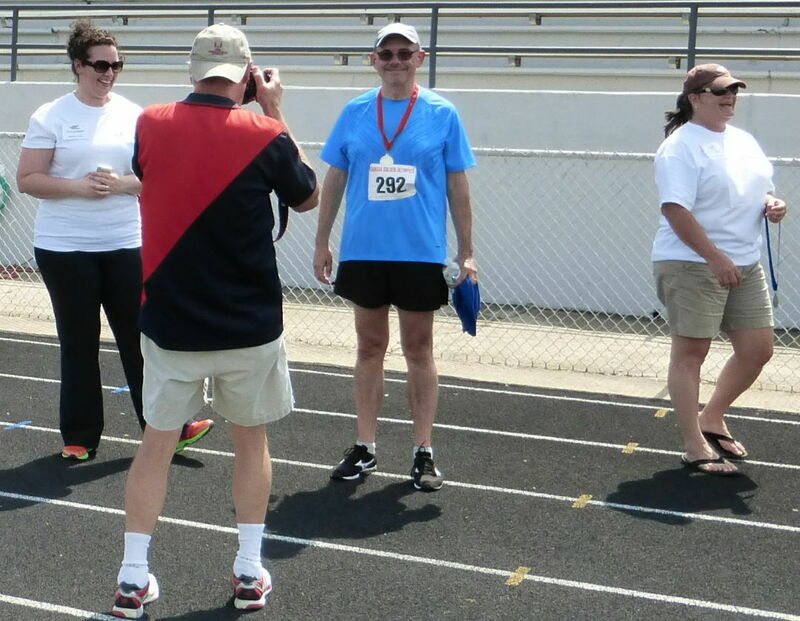 After picking up my wife Mary Ann, checking out of the Hampton Inn on Watson Blvd and getting a bite to eat, we headed over to the stadium to watch the 100 meter dash. I ran in to a fellow I had met back in Alpharetta training at the Old Milton High School. 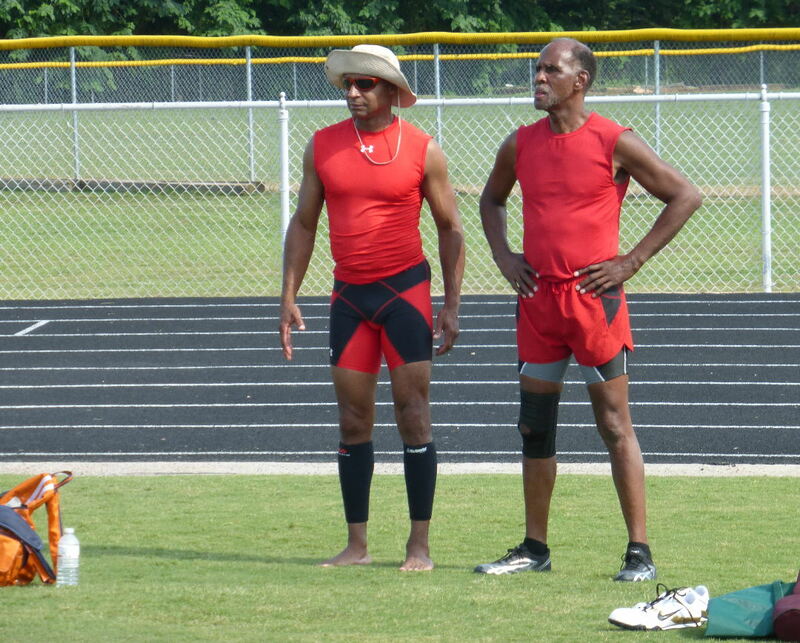 He is 80 years old and had won the 50 meter dash the day before and I watched him win the gold in the 100 meter race too. He did it faster than I could have and I am only a baby at age 68. He’s the gentleman at the top right in while shirt in the photo below. 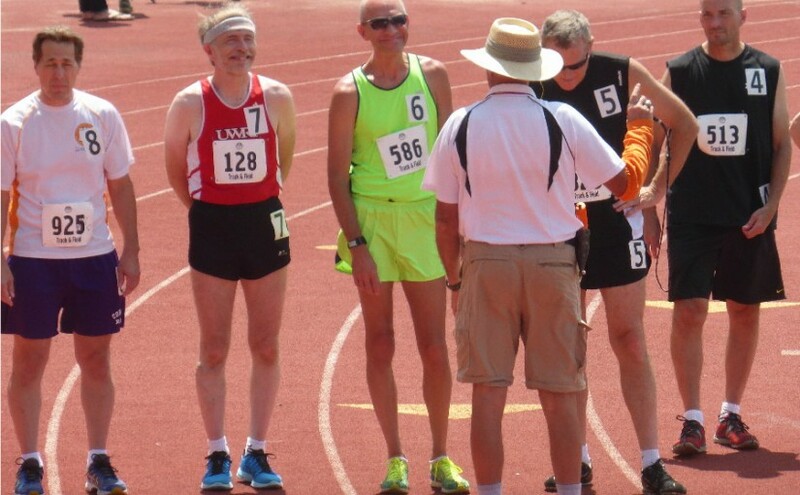 Mary Ann’s brother Mike and wife Diane were nice enough to come watch me compete at 1pm in the 1500 race walk. I was uncertain as to how it would be going since I had only been race walking for two months and had hurt my hip a week before. 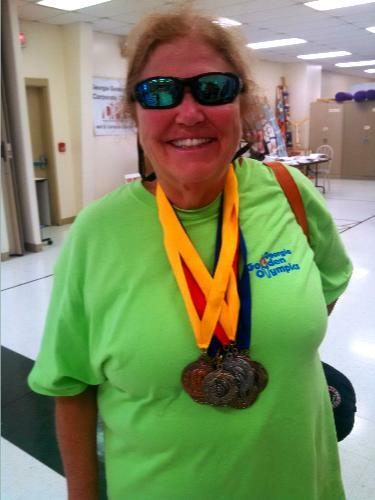 I did good and came in second in my age group winning the silver and qualifying myself for the National Senior Games. I think I may just make the trip to Minnesota for the National’s next year. While getting my medal engraved back at the senior activity center I stood in line with other medal winners and we shared our excitement and stories. One lady (pictured below) had won several medals in shot put, discuss, race walking and others and is also planning on going to the nationals. We made the ride back to Atlanta tired but happy that I had won a medal. 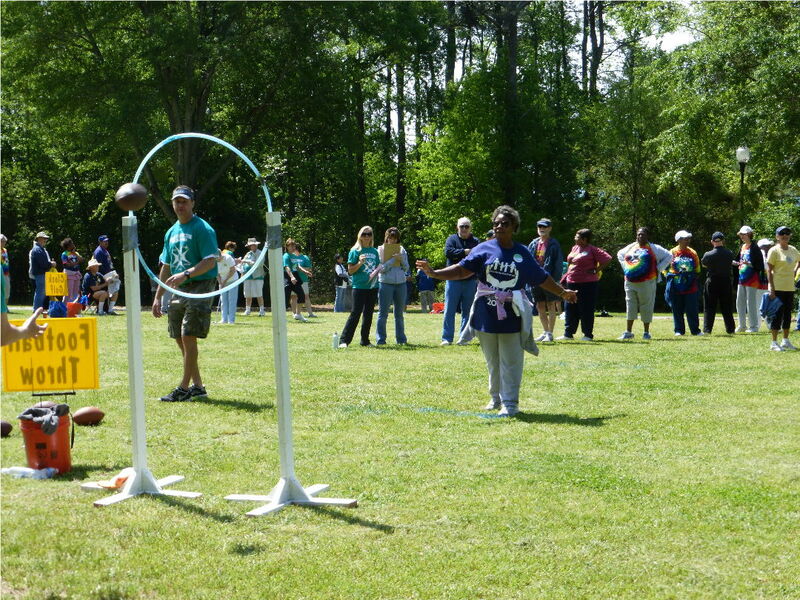 I would have loved to stay longer and participated in and viewed more of the competitions. Maybe next year I will stay two nights instead of one. The registration is not open yet for the Nationals but when they do open this Fall, I will be planning my trip. This will be a great incentive for me to continue my race walking hobby and really improve my technique, speed and endurance. I plan to enter the 1500 meters and the 5K race walks. They are on two consecutive days so that will work out fine. I have been to Minneapolis before to attend a conference but my wife never has been there. Attending the Nationals will be a good excuse to have a vacation getaway for us. 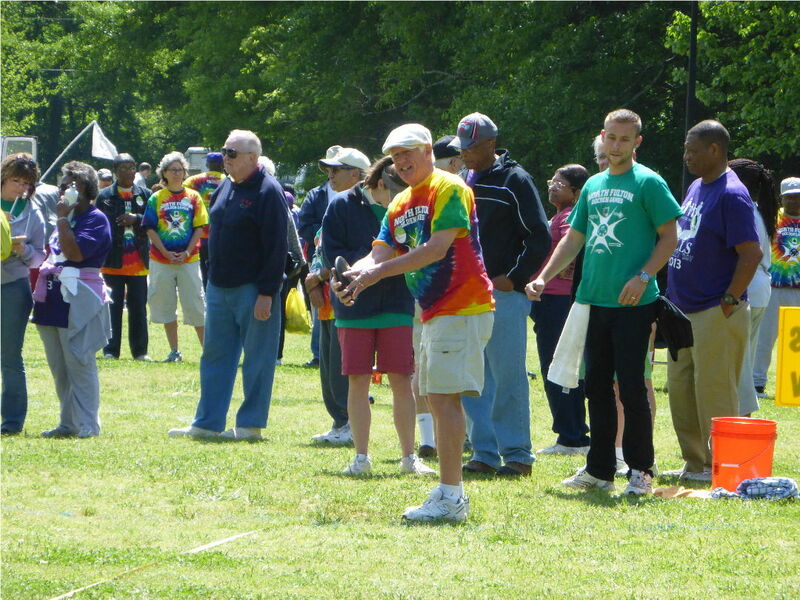 For more information on the National’s, visit their web site at National Senior Games Association. 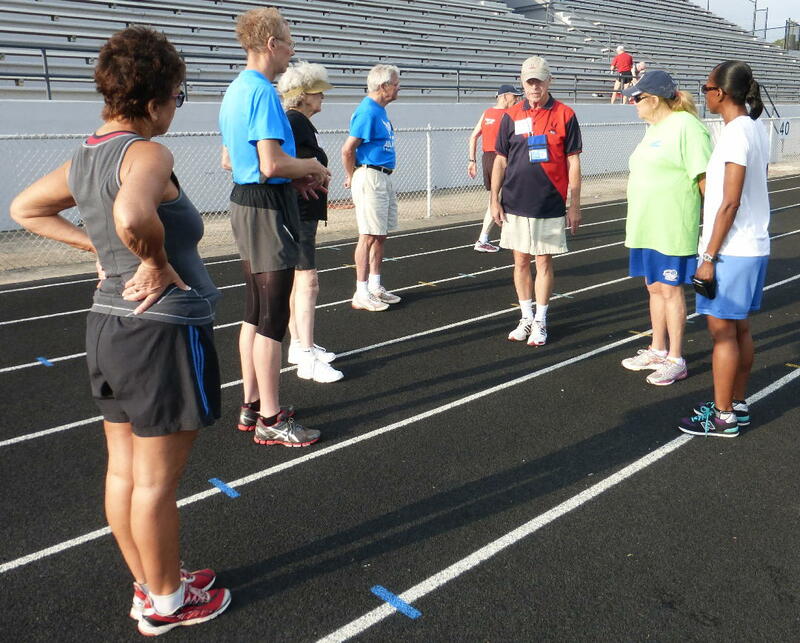 For more information on Race Walking, visit Jim Norvill’s excellent site eRaceWalk.com. 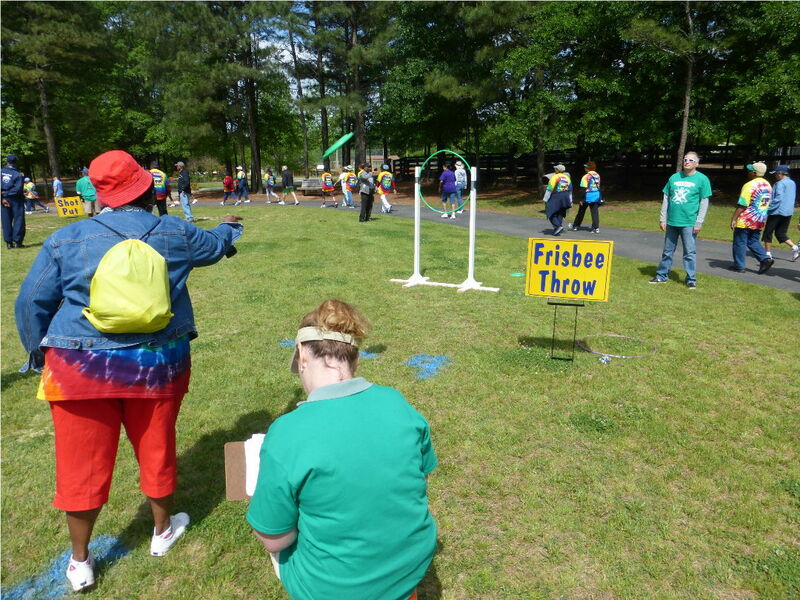 This week I was a participant in the North Fulton Golden Games, a collaborative effort by 5 local cities that provides a month-long series of Olympic-style events and activities (shot put, discus, one-half and one mile walk, one-mile run, tennis, golf, and bowling) for adults age 50 and older. 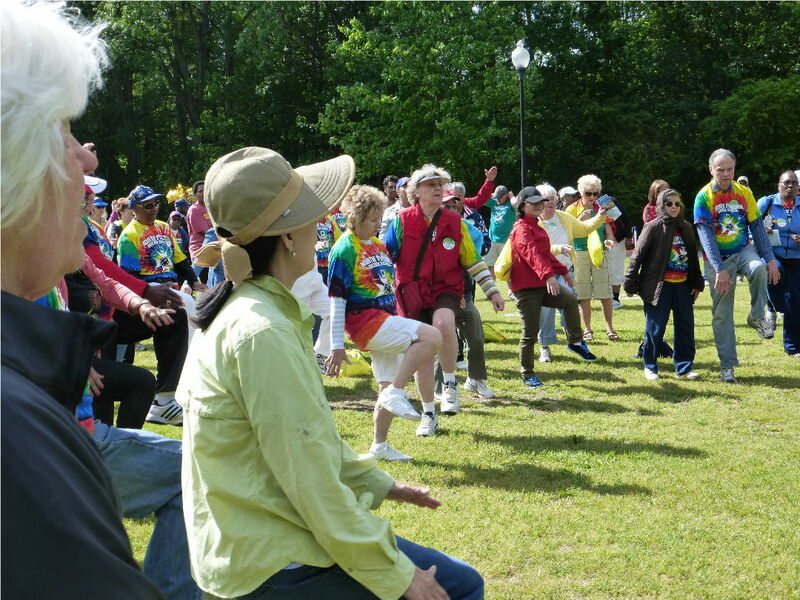 Participants compete in track and field events, pickleball, tennis tournament, golf tournament, Bocce ball competition, ball room dancing, swimming and more. 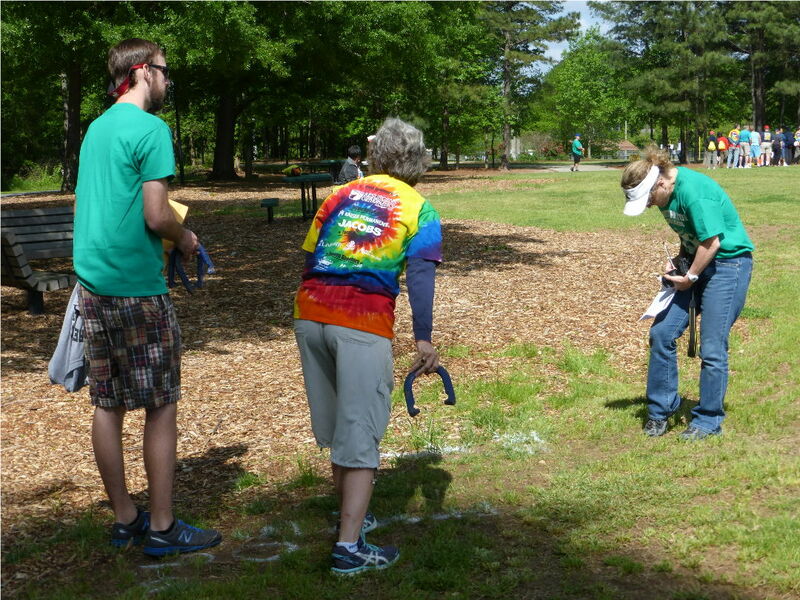 I came in first in the one-half mile walk in my age group and enjoyed several other activities. Our senior center helped with sign up and even transportation. 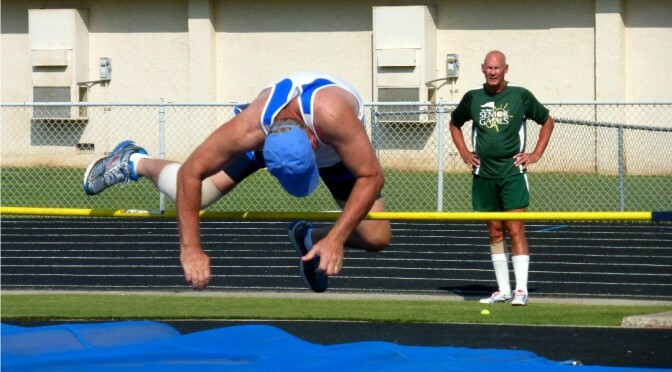 There is a state competition and in my state it is the Georgia Golden Olympics which is scheduled for September 17-20, 2014 in Warner Robins, GA. Every state has a similar event and here a senior games list by state. All this feeds into the National Senior Games Association which will have the 2015 National Senior Games in Bloomington/Minneapolis/St. 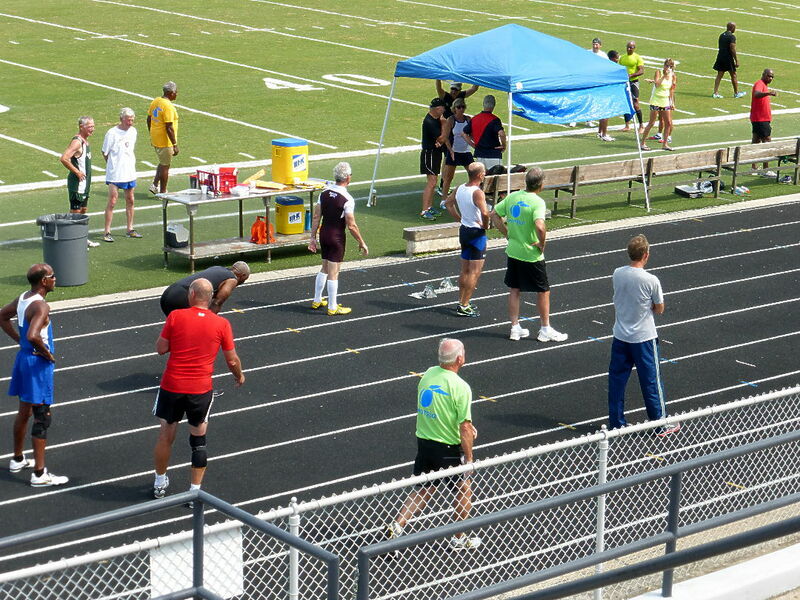 Paul in July 3-16, 2015 in which they are expecting 12,000 athletes ages 50 and up from all over the county. 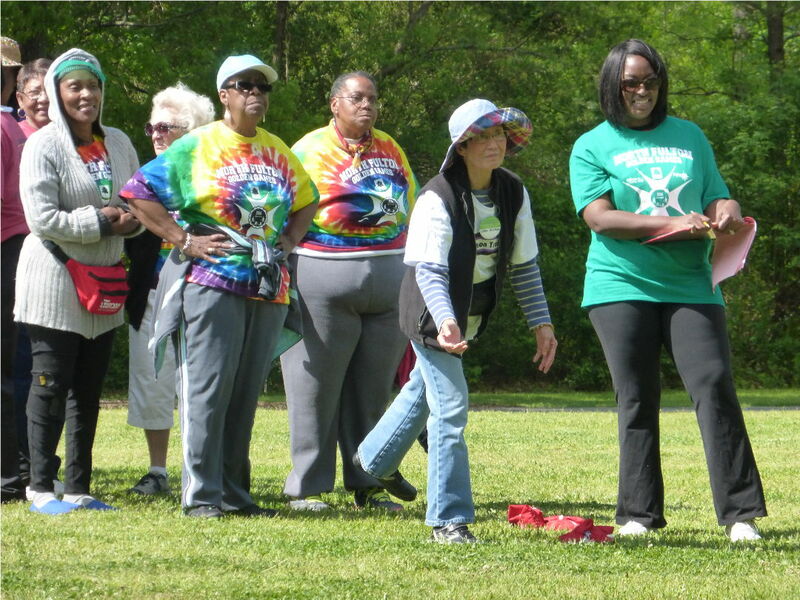 Here are some photos from our local senior games. football toss – good throw! 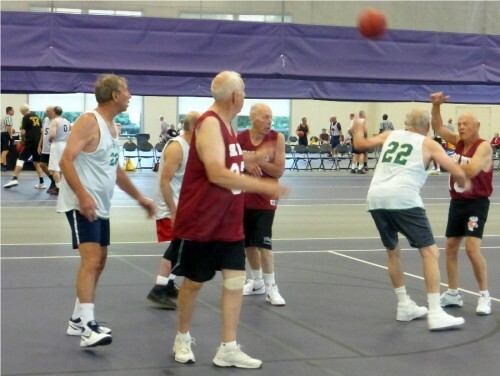 National Senior Games will be in Minnesota July 3-16, 2015. Working Boomer has been giving a lot of thought about getting involved with her community senior center. 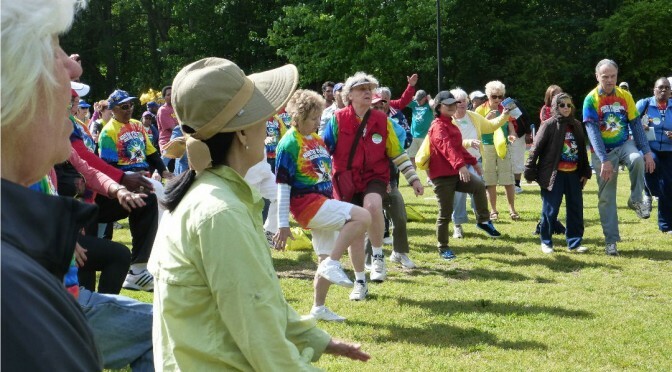 Here are 30 reasons boomers and seniors should visit their senior activity centers. Some of you may know that I am a single working boomer. Lately, I have been giving a lot of thought about getting involved with my community senior center. Since I work the night shift and all week ends it is difficult to have a social life. Also my family has been suggesting that I check out the senior center in my community. So I did a little research on senior centers and discovered a good deal more about them, their programs and activities. There seems to be many good reasons to visit and participate in the community senior center. Maybe you can relate with me as I list some of the benefits that I might expect in my own life as I use my senior center. At a senior center I can make new friends. There will be a lot of friendly folks there to love and love is a good thing. The center has healthy tasty meals and I love to eat. There is a place to exercise and workout. I really need to loose weight. They have a billiards room therefore I can really get into that. The folks there go on senior trips by bus. Since I drive for a living, it will be nice to allow the bus driver to do the driving for me. Sometimes they go to the gambling boat. I love to play those slots. They do taxes. I have never done mine so not only can I get someone to do my taxes just maybe they will teach me how to do them. It will be a great opportunity to give away a smile. My dog doesn’t really care if I smile or not. I work night and don’t see many folks therefore I am not involved in much smiling. It is very inexpensive and I live on a limited income. Most of the activities are free. The center is within blocks of my apartment and it will not take much gasoline to drive there. They even have a bus that will pick some folks up. Since it is in my plan to move from here to a over 55 apartment or senior community, I am sure that I can get information about the best places in the area. Who knows, I might even find a good roommate. Since I am off 2 days during the week, it will give me something to do. I might even want to volunteer. There is a huge crowd there on bingo day. I might even get good enough to play more than one card plus I like to play games. Sometimes they do crafts. It is finally time that I learn to do some and get into the arts. It would be an excellent way to learn more about my community. There are times they go out of town on mini trips. I have a lot of vacation time therefore I could enjoy vacationing with others. As I get older and even now, it is important to have a support system. At a senior center I can develop that. The center has meals on wheels. The last time I had a hospital stay, it was difficult to fix meals for myself. This would be real nice. Also, I might be able to get assistance for transportation if I am unable to drive to the store. This blog is getting very lengthy. That is a good, thing because I am now excited about getting involved at the senior center. There is much more that I could write but I will wait and write more after I have attended. It is amazing when one writes out a positive list how much more exciting a new adventure can be! Well I took the AARP Driver Safety Class yesterday at the Johns Creek Active Adult Center. It was a six hour class attended by a small group of six and professionally taught by a retired school teacher volunteer. I would say three boomers and three seniors. I had heard different things about this class, but I enjoyed it and would recommend it. The obvious reasons for taking the class are to get a 10% premium discount on your auto insurance (if you don’t have any tickets in the last three years), to get up to date on your driving skills and safety, and just because it is an enjoyable thing to do, which is reason enough in retirement. Robin on Facebook asked me what I learned and I replied: 1. Keep three seconds between you and the car in front 2. adjust your side mirrors so that you can’t see the side of your car 3. Position your grip on the stirring wheel at the 4 and 8 position. I had always had my hands on near the top of the wheel. Those are just the highlights; there was so much material they give you a nice AARM Driver Safety Program participant workbook with the information spelled out very nicely. They pointed out that much has changed since we started driving. Back then we didn’t have seat belts and cars didn’t even have a side mirror. Do you remember that? The headlights were very poor and beamed only straight ahead with a narrow focus. Cars were loud, smelly and overheated radiators and flat tires were a part of many road trips. Oh, the good ole days! But people did take their time and we courteous. 1. Amber tinted sun glasses, as they are good in sunlight. 3. Try the Driver’s Test for Reaction Time and other Senior Driving Games Try the sheep games, it’s fun and interesting and see how you did. 4. Failure to yield the right of way is the number one problem of senior drivers. In summary, I enjoyed the class and I think everyone should take it. The course is for anyone over age 50, which includes just about all of us baby boomers. When you quit being a road warriors doing to work everyday, things change in you outlook about driving. You are not as aggressive and in such a hurry to get someplace. Your driving skills may be refreshing.